L: 34" x W: 39" x H: 43"
Stein Leather-Look Recliner With a warm, rustic flavor and a comfortable design, the Stein leather-look recliner beautifully accents any living room. The leather-look upholstery features a comfortable seating cushion and a plush bustle-back design accented with decorative stitching, all of which is perfectly complemented by the mission-style showood. With a warm, rustic flavor and a comfortable design, the Stein leather-look recliner beautifully accents any living room. The leather-look upholstery features a comfortable seating cushion and a plush bustle-back design accented with decorative stitching, all of which is perfectly complemented by the mission-style showood. From order to delivery, to enjoying these chairs ( by two overly nourished adults) we are totally satisfied. Chairs are SUPER comfy, work well, look just as advertised. Delivery was 5 star - communication with truckers was perfect and set up was also quick and efficient. Much appreciated. Kudos Raymour and Flannigan! we will be back! Very comfortable ~ easy to recline .. roomy. Perfect for reading, relaxing, watching tv or fully recline it and take a nap! This is a nice comfortable chair. It is not as bulky as the typical recliner and adds a nice accent to the room. Hubby likes this chair as he is tall and the chair is taller than our other furniture. Hubby loves his new chair. The chair is tall and he is very comfortable in it. My total shopping experience at Raymour and Flanigan was first rate. The service, price and quality of my new furniture were all outstanding. I will be back for more as a return customer! Love this chair! Fits my rustic cabin lodge room feel! Super comfy and stylish. Chair is sturdy, comfortable and has a great look. I'm very happy with this chair. It's attractive, well-built, and very comfortable. The salesman at the West Windsor outlet was very helpful and the two deliverymen were prompt and professional. This chair was a great value and my shopping experience was excellent from start to finish. Where was the chair made? Is the wood solid wood or veneer? BEST ANSWER: Hello Valerie, thank you for your interest in the Stein Leather Look Recliner! The frame materials are made up of solid wood and engineered wood. It is manufactured in China. How durable is the faux leather? BEST ANSWER: Proper use and using the recommended cleaning care, leads to a long lasting chair. How far back does this chair recline? The picture just shows it reclining a little. Does it go all the way back? BEST ANSWER: The length of the Stein Leather-Look Recliner fully reclined is 71 inches. There needs to be at least 15 inches between the recliner and the wall. Are these chairs available in the stores? My husband would like to sit on it before buying it. BEST ANSWER: The Stein Leather-Look Recliner is an Outlet item and is displayed at our Raymour & Flanigan Outlet Centers. For assistance in locating the closest Outlet Center from your zip code area, please call 866-383-4484, option 3. Is the recliner all ready put together upon delivery? BEST ANSWER: Yes. With Raymour & Flanigan's White Glove Delivery service, delivery includes all necessary assembly and a comprehensive quality inspection of your furniture prior to it being delivered to your home. I have a credit from a Raymour Flanagan store location. Can I apply it to this order? BEST ANSWER: Absolutely! For assistance, please call 866-383-4484 option 3. 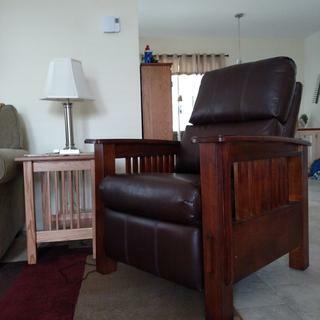 I have a similar recliner, though my side wood pieces have 16 square cutouts? Do you have anything like that or maybe you can send me a layout? Wood is cracked. BEST ANSWER: The Stein Leather-Look Recliner is the closest option we offer to what you have described, however, we would be happy to assist you further at 866-383-4484, option 3.